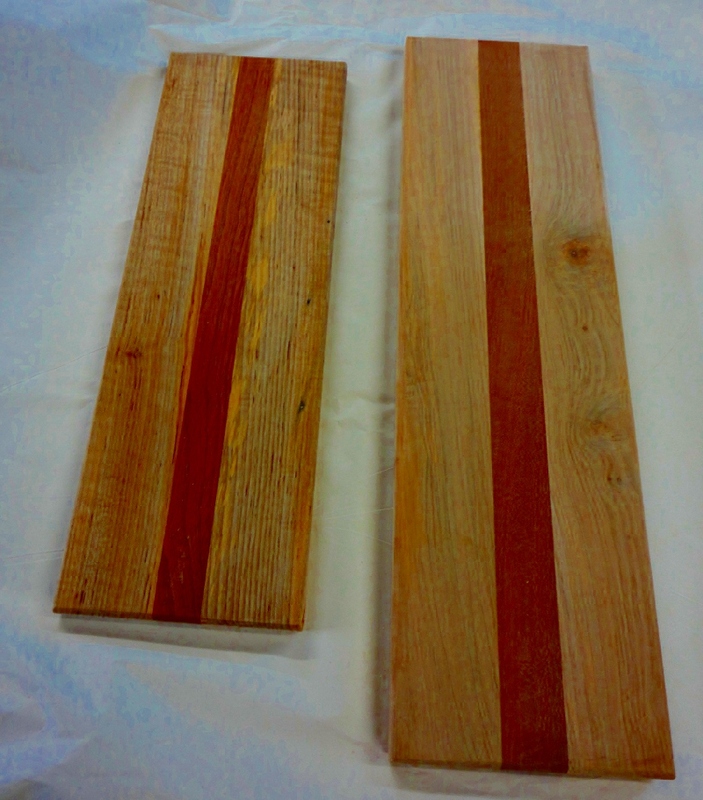 I completed several bread boards last month. They were Christmas gifts, so I didn’t post any pictures when they were made. Actually, it wasn’t just a project that I made. The boys assisted as well (mostly sanding). However, they each made one by themselves (with my help – I did the table saw work, but they did use the router table and drill press with assistance). They were actually a pretty simple (and quick) project to complete. I constructed them from maple and sapele and finished with an oil/wax mix, and purchased dipping cups to go with them. My initial thought was for them to be the right size for sliced bread and an oil dip. However, the dipping dishes wound up a little small for that (next time I should get the 4oz dipping dishes). Maybe they will work as sushi plates. We recently picked up a piano. Ok, so we didn’t pick it up recently, but it took a couple of months to get it moved from the garage into the living room. It still needs to have some of the key tops replaced (I have them on order) and get it tuned (I’m leaving that to Susanna to arrange – I don’t play and can’t really tell the difference between an in-tune instrument from an out-of-tune one). A new piano meant we were short a piano bench. I decided to make a quick build piano bench out of red oak (and yes, I’m finally getting low on the red oak collection that Rob Sawyer and I picked up two years ago – but not to worry, I have a whole tree worth of red oak drying in the barn that should be ready for next summer). The design is pretty simple. Four legs, aprons to support the legs, and something to sit on. Basically a piano bench. The only design feature is tapered legs (on two sides). First step was to mill lumber from the rough oak. 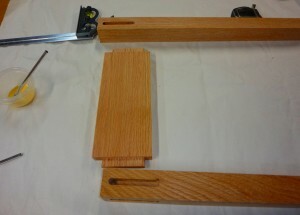 No problem, I even found some thick stock so I could make 4 legs that were 1 1/2 inches square without gluing up. The next step was to cut the mortise – I used a straight bit on the router table. I used stops for the start and finish of the cut and cut no more than 1/8″ in depth on a pass. However, I didn’t like how close the mortise was to edge of the leg (I was being lazy and didn’t want to drill another hole for router table fence to get the spacing right). 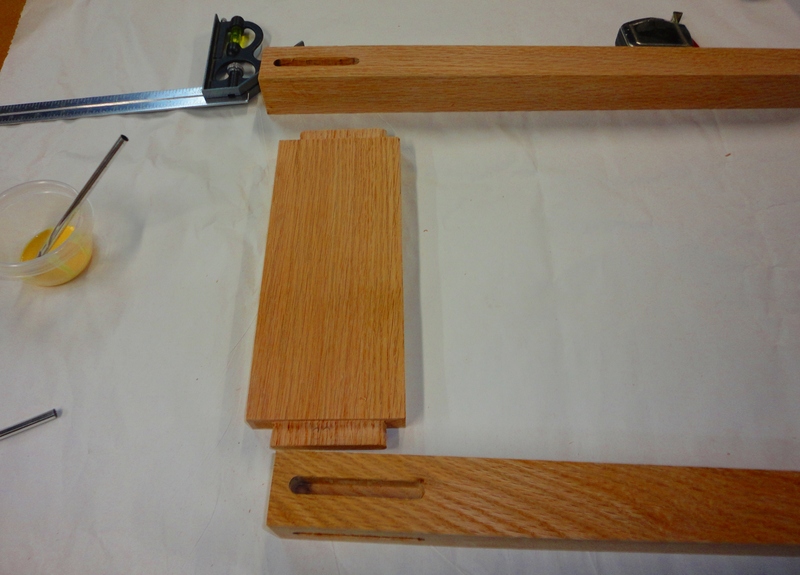 And once the mortise is cut… well… one is stuck with the location. So back tot he lumber pile for another piece of thick oak. The original 4 legs are in the fire pile, and I made 4 new legs (and no more than 2 minutes to adjust the router table fence). They turned out nice. The only thing I would do differently next time is do a better job measuring where the router bit started and stopped cutting (maybe get the mortise closer to the top of the leg). Next, I cut the tapers on the legs. I don’t have a tapering jig for the table saw, so I used the jointer to make the tapers. I don’t remember where I exactly I found the technique (maybe wood magazine? 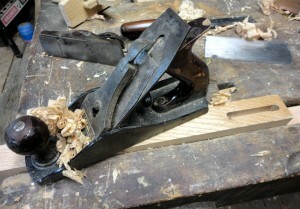 ), but it requires two passes on the jointer – the first by starting the cut at the 1/2 way point of the taper. 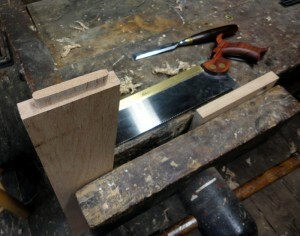 It wasn’t a perfectly clean cut, but not bad at all – only requiring a little work with the smoothing plane to finish. I finished the legs by hand planing chamfers on the bottom of all the legs. I milled and cut the aprons to length. 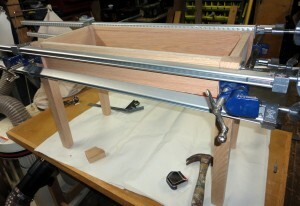 Then, I cut the tenons on the table saw (using a dado stack). Then the top and bottom shoulders were cut away by hand. I rounded over the ends of the tenons with a chisel and cleaned up the shoulders. I did a dry assembly, checked for square, then everything went back to the bench to be cleaned up (smoothing plane then cabinet scraper and finally a light sanding by hand). Finally tonight I did the glue up. 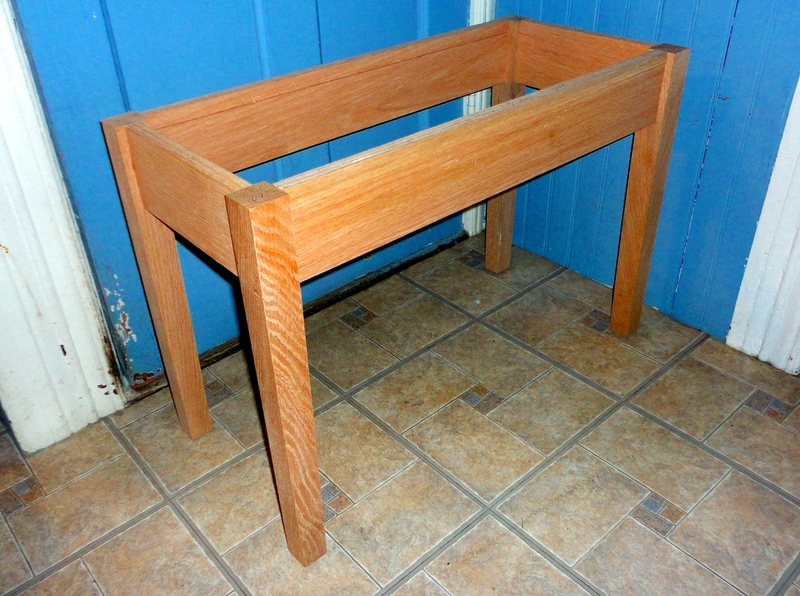 The joints came out pretty good (this was the first time I made mortise and tenon joints not in a class). This week I will apply a dark stain and finish the piece. I plan on cutting a top out of plywood, and Susanna will cover it with padding and fabric (to make a padded seat). I did set aside oak to make a plain top if the padded seat doesn’t work out (I’m worried that the pad may make the seat too high). What would I do differently next time? I would start the tapers lower on the leg. I think one of the tapers actually ends under the start of the apron. The mortise and tenon joints are pretty tight, but not perfect. It wouldn’t take too much time to add some shape to the front and rear aprons, and that might make the bench stand out a little more. Next project: Maybe painted bookshelves for the library/study. I’m trying to figure out the best way to use a single sheet of plywood to make as many shelves as possible.